The subprime mortgage meltdown has cost the world 15% of its market capitalization, about $9 trillion. The primary culprit who caused all of this financial loss, pain and suffering is not the mortgage companies. Neither is it the overextended borrowers. It is our own federal regulations interfering with the free market. For over half a century, only 45% of Americans owned their own home. Then home ownership rose in the postwar period, settling at about 64% in the early 1990s. In 1994, President Clinton had the good intention of raising home ownership to 67.5% by 2000. He sponsored the revision of the Community Reinvestment Act (CRA) regulations, which required banks to increase mortgage lending to low- and moderate-income families. The banks complied and increased their lending to these families by 80%, more than twice any other group. The sentiment was noble but ill advised. Community groups could now prevent banks from mergers, branch expansions or the creation of new branches simply by protesting to any of four different regulatory agencies. But these traditional activities of banks are necessary to stay responsive to the dynamics of the marketplace. To maintain this ability, banks paid millions to these community groups. In theory, they were supporting mortgage education efforts and fair lending practices. In reality, they were carrying a block of poor loans on their books simply as the price of doing business. These community groups described the regulatory pressure forcing banks to increase their underwriting of low-income loans as a positive and encouraging trend. Bruce Marks of the Neighborhood Assistance Corporation of America boasted to the New York Times that he had gotten $3.8 billion in loan commitments in the city of Boston alone. Faced with excessive regulatory interference, banks risked additional loan defaults rather than face financial penalties and blocked business. But in a situation characterized by excessive regulation, we all pay the price. Part of the good intention was forcing banks to be good neighbors by making altruistic loans that discriminated in favor of underprivileged communities. Any attempts by banks to set higher rates, terms or conditions on people with questionable credit was labeled “predatory lending” and used to hold lenders hostage. This form of price controls held the price on questionable loans artificially low. Normally, price encourages consumers to self-ration and to use less of a limited resource such as capital and put it where it is likely to do the greatest good. Price controls cause shortages because lenders protect their losses by extending fewer risky loans. But this time, regulations forced them to continue making the loans. Price controls and lower interest rates caused a surge in the demand for mortgage loans. In response, banks raised the requirements to qualify for a traditional loan and wrote more adjustable-rate mortgages (ARMs). Even ignoring their poor credit rating, questionable borrowers could only qualify for an ARM, and they could barely afford the low teaser. Clinton’s goal was met in 2000 and then surpassed, boosting U.S. home ownership by 2005 to 68.9%. Ownership for minorities grew by 24.1% between 1993 and 2005, nearly three times the rate of for non-minorities. Another good intention driving the legislation was that home ownership correlates to building wealth, stability and community support. If only we could get struggling people to own their own home, they too could share in the American dream. But we build wealth by deciding consciously to delay purchases such as a home, not to overextend ourselves financially to reach our goals. The idea was that purchasing a home is an investment. But the home you own is not an investment. An investment pays you money. Rental property is an investment. The house you live in is a liability, which increases proportionately with its size. The fastest way to own a house is to rent as small as possible and save and invest the difference. Low-income households have limited resources, and home ownership drains too high a percentage of their income. In fact, studies show that low-income home owners save less than renters and have less of an emergency fund. The belief was that home owners build equity in their homes by making regular payments that include both interest and principal. For most families, paying a mortgage is a forced form of savings. But this assumes home owners have the cash flow that allows them to build equity in their houses. Encourage those unaccustomed or unable to save to become home owners, and they are apt to refinance and take any growing equity out of their house to fund other expenses. Another good intention was the assumption that mortgages are always good business for banks. Lenders who didn’t cheerfully agree were accused of discrimination against minorities by using “old-fashioned” criteria, such as the size of the mortgage payment relative to applicants’ income, their credit history or verifying their savings and income. Instead, applicants merely had to demonstrate their ability to manage debt by attending a credit-counseling program. But these old-fashioned criteria were historically what made loans secure and limited defaults. Forcing banks to lend money to those least likely to repay is not a sound policy. That the credit debacle took two presidential terms to unravel is simply how economics works. Dropping interest rates and rising house prices masked the default rates as those who would have defaulted simply refinanced a larger loan, milking their homes for 100% of their value like an ATM machine. Economist professors Stan Liebowitz and Ted Day criticized the program in 1998 in their article “Mortgages, Minorities, and Discrimination” in Economic Inquiry. They wrote, “After the warm and fuzzy glow of ‘flexible underwriting standards’ has worn off, we may discover that they are nothing more than standards that lead to bad loans. . . . [T]hese policies will have done a disservice to their putative beneficiaries if . . . they are dispossessed from their homes.” Unfortunately, no one ever listens to economists. Everyone was busy praising lenders using relaxed underwriting standards as the paragon of virtue. 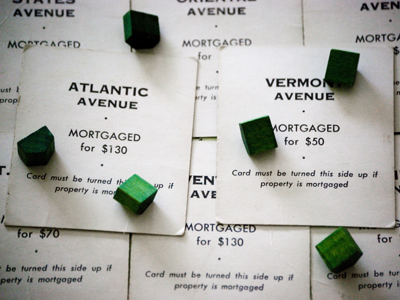 Although widely understood that approving minority mortgage applications stretched the rules a bit, it was considered good social engineering. Now they are universally criticized by the same crowd that formerly praised them. Today, the people who advocated lax lending standards are self-righteously critical of lenders for letting this debacle happen. Having forced millions of bad loans, they are now complaining the government is paying a small portion of the losses back to Bear Stearns. Having enacted regulations that ruined the U.S. financial markets, they now claim the credit problems stem from a lack of regulation. Only government uses its power to cause such havoc and then asserts it needs more power. Bailing out borrowers makes the least sense of all. Although routinely cast as victims, we must remember they substituted attendance at a credit-counseling class for hard collateral in their promise to repay. They purchased homes beyond their means, lived in relative luxury and bilked banks of any building equity by refinancing cash-outs of their homes every time real estate markets appreciated. Although it isn’t their fault for padding their lifestyle by exploiting regulatory mistakes, borrowers don’t deserve a penny more. Regulators especially don’t deserve a second chance to impose rigid rules on a system that requires dynamic adjustments. Having been hurt so badly by the conspiracy of regulators and irresponsible borrowers, we should at least allow lenders the consolation of foreclosing on the house of cards. If the subprime meltdown was the result of greedy capitalists, you would have to assume they were awfully dumb to have lost so much money. The markets are smarter than that. Only feel-good legislation could be so naive. How can more government regulation help when there is universal ignorance of how the government caused the problem in the first place? $ ?s: Buy a house without a credit history?